Teena and I have been watching a new shopping/tourist area being developed on Bathurst just below King, by the train bridge. It's a series of shops inside converted new shipping containers and the market is appropriately called stackt. Through the use of shipping containers, we’ve taken unused land and transformed it into an experience of curated discovery. We’re the ever-changing end result of a cultural lifestyle market mixed with a community meeting hub, in a space designed to feed your curiosity and inspire your thinking. Come discover what stackt contains …The different containers are wired and ready to go. The shops can be rented by the day, month or six month period, which is great as there will be an ever changing variety of places to see. The containers can also be rented as singles or doubles. Some units are shared. In one of these, I purchased a meditation ring from Laborde. Looks nice, doesn't it? I was surprised when we reached the back. There was a large beer hall and patio. Belgium Moon brews on site. There were places to purchase food inside and out. I hit this tent for a bowl of Humpty Potato Salad, a potato salad done southern style. Wow! Was it delicious! Chunks of red potato, a creamy dressing, bacon, green onion, celery for crutch and whatever seasoning. I'll get it again next time I'm there. We met a nice couple of friends, Perry and Amelia. The view from the door of the beer hall. I see on the stackt website they will be showing outdoor movies in the open area starting in May. Might have to drop in for that. Teena and I are looking forward to going back, especially on a nice warm afternoon. Today I finished Bit Rot by one of my favourite writers, Douglas Coupland. 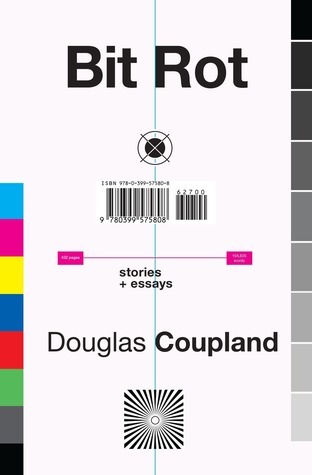 Bit Rot, a new collection from Douglas Coupland that explores the different ways 20th-century notions of the future are being shredded, is a gem of the digital age. Reading Bit Rot feels a lot like bingeing on Netflix... you can't stop with just one. "Bit rot" is a term used in digital archiving to describe the way digital files can spontaneously and quickly decompose. As Coupland writes, "Bit rot also describes the way my brain has been feeling since 2000, as I shed older and weaker neurons and connections and enhance new and unexpected ones." Bit Rot explores the ways humanity tries to make sense of our shifting consciousness. Coupland, just like the Internet, mixes forms to achieve his ends. Short fiction is interspersed with essays on all aspects of modern life. The result is addictively satisfying for Coupland's legion of fans hungry for his observations about our world. For almost three decades, his unique pattern recognition has powered his fiction, and his phrase-making. Every page of Bit Rot is full of wit, surprise and delight. I really enjoyed Bit Rot. The description above says the book is full of essays but they're not really essays but what I would call musings. Most are only 2 or 3 pages in length. Almost all are thoughtful or hilarious. I found most to be true. Written in 2015, it all still rings true 3 years later. Some of his thoughts on the future of humanity even seem to be uneasily accurate. If you are a fan, you'll enjoy a few appearances from the Channel 3 news team. I wonder what he has against them. For a book of short stories and such, like this one, I always enjoy reading it in short bursts, a story or two a sitting. as a result it took me awhile to finish it. Douglas Coupland is Canadian, born on a Canadian Air Force base near Baden-Baden, Germany, on December 30, 1961. In 1965 his family moved to Vancouver, Canada, where he continues to live and work. Coupland has studied art and design in Vancouver, Canada, Milan, Italy and Sapporo, Japan. His first novel, Generation X, was published in March of 1991. Since then he has published nine novels and several non-fiction books in 35 languages and most countries on earth. 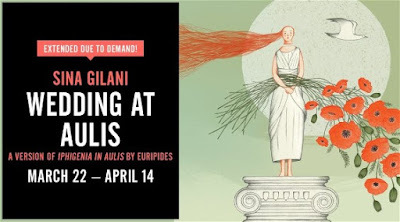 He has written and performed for the Royal Shakespeare Company in Stratford, England, and in 2001 resumed his practice as a visual artist, with exhibitions in spaces in North America, Europe and Asia. 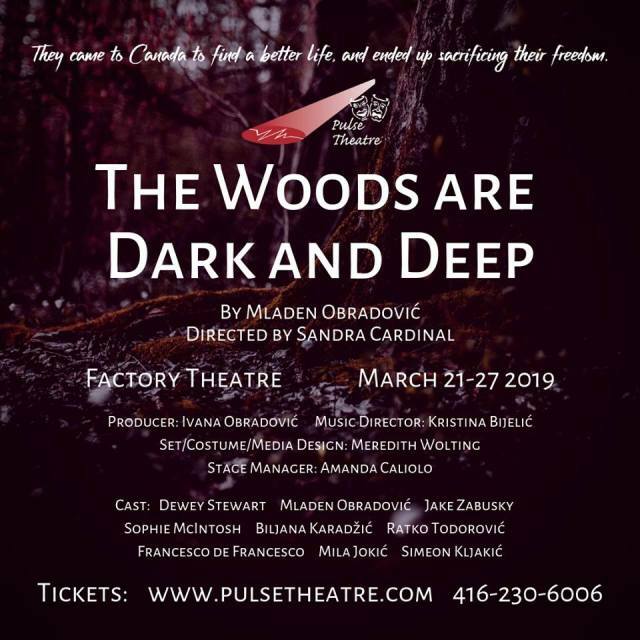 This evening Teena and I went to see The Woods are Dark and Deep at the Factory Theatre at the corner of Bathurst and Adelaide. They came to Canada to find a better life, and ended up sacrificing their freedom. Our story follows a small group of Serbian and Ukrainian immigrants who ended up in a Canadian internment camp during WWI. This is Pulse Theatre’s fifth production and we are very excited to work with a mix of old and new collaborators. 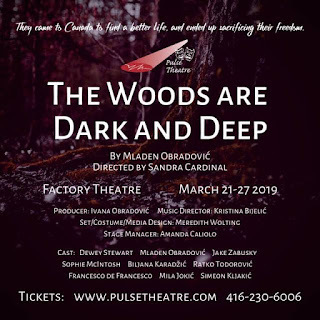 This show is dedicated to immigrants and is a celebration of the sacrifices they made for this country to be able to grow, both economically and democratically. Based on historical events. Canada, as great a country as it is, does have some shameful events regarding refugees in its past like turning away Jewish refugees and Japanese internment camps in World War Two. This is something I had never heard of before, the internment of Serbian and Ukrainian immigrants, known as "enemy aliens" in the First World War. From 1914 to 1920, Canada interned 8,579 enemy aliens in 24 receiving stations and internment camps. They cleared forests for parks, including Banff National Park. 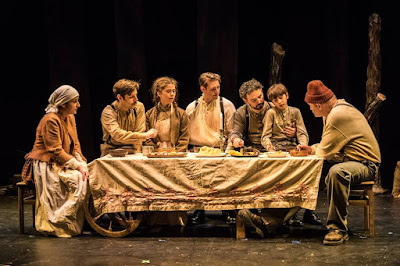 The play revolves around a group of workers clearing a forest. 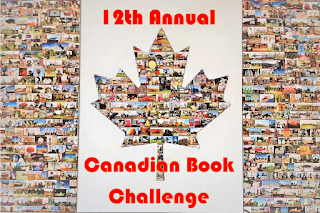 One now hates Canada because of what had happened and another, Janko, is in love with a young woman, Claire, he met before being arrested and interned for the remainder of the war for incorrect paperwork. The three men and the family they are friends with lead a hard life in the forest. I thought Dewy Stewart, who played Janko, was excellent as was Mila Jokic, as the hopelessly romantic and optimistic daughter of the family, Olessya. Too bad the play is not running longer. There was a large crowd for this performance and it is a well-acted and produced play, plus a story worth telling. 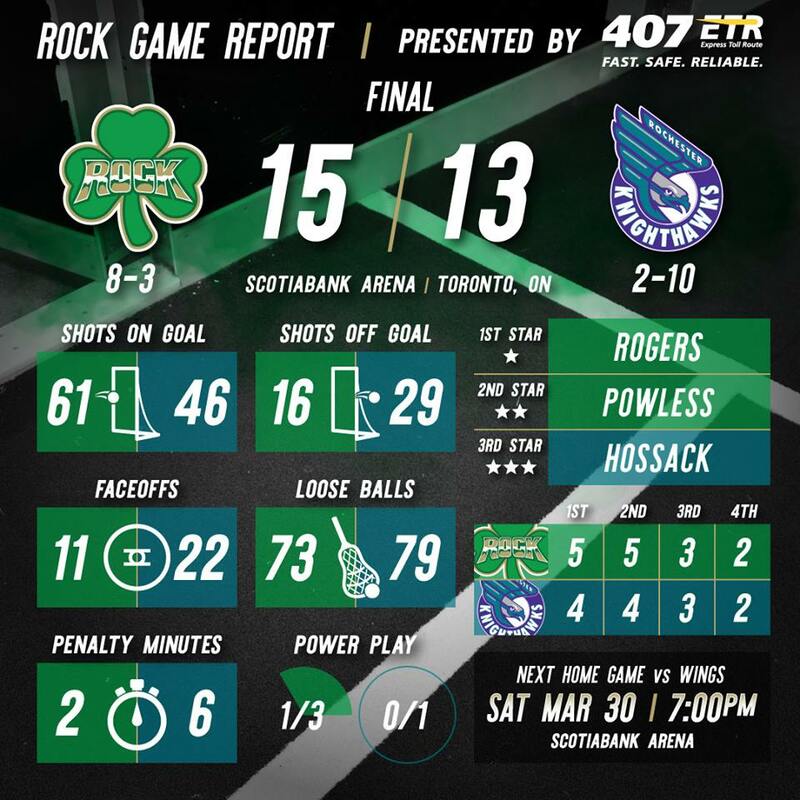 Tonight the 7-3 Toronto Rock took on the 2-9 Rochester KnightHawks in front of 12,873 enthusiastic fans. It was a wild affair. Being the night before St Patrick's Day, a drum and pipe band joined in the opening ceremonies. Rona and Jacob joined Teena and I for the game. It was the first time for both and they loved it. Opening face-off. Rona pointed out that the Rock were losing the majority of face-offs. The end of game stats proved her right. The Rock only won 33.3%. The game was tight throughout with the Rock leading by 5-4 at the end of the first quarter and 10-8 at the half. Iggy was there working the crowd. The Toronto Rock cheerleaders performed a few times. Nope. We didn't win today. It would have been nice. At the end of the third quarter, the Rock still led by two goals 13-11. With just over a minute to go, Rochester scored to come within a goal of tying it up. With their goalie pulled, Damon Edwards charged down the court and put in the empty net clincher for a 15-13 Toronto win. The win puts the Rock into second place in their division. They have a chance of clinching a playoff spot with their two away games next weekend. The top 4 teams make the playoffs with 1st place taking on the 4th place team and 2nd and 3rd clashing in the other. In two weeks the Rock are at home against the Philadelphia Wings. We'll be there. I'll end with an artsy, unexpected photo of the game.